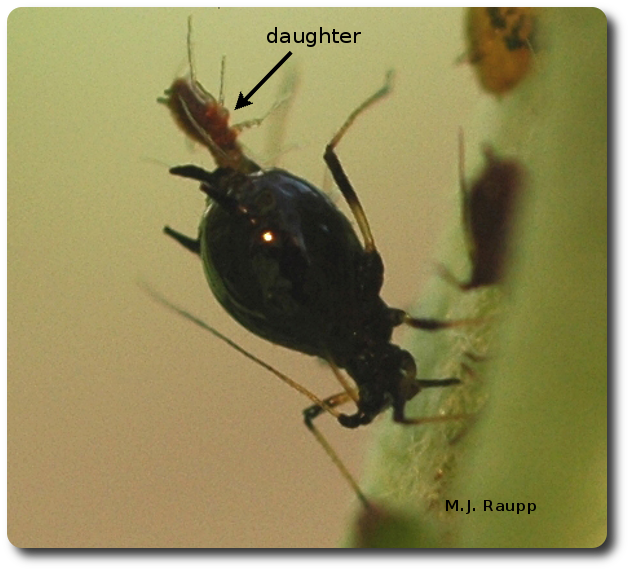 An aphid mom multitasks by giving birth to a daughter while sucking plant sap. Cool temperatures and abundant rainfall have conspired to produce luxuriant growth in trees, shrubs, and herbaceous plants throughout the region. New leaves and blossoms result in a steady flow of nutritious sap within plants through a specialized vascular tissue called phloem. Phloem is a favorite feeding station for many types of sap-sucking insects including aphids. Aphids of all description are having a heyday during these glorious wet days, but the aphid’s saga began many weeks ago when eggs deposited on plants last autumn hatched into tiny nymphs. 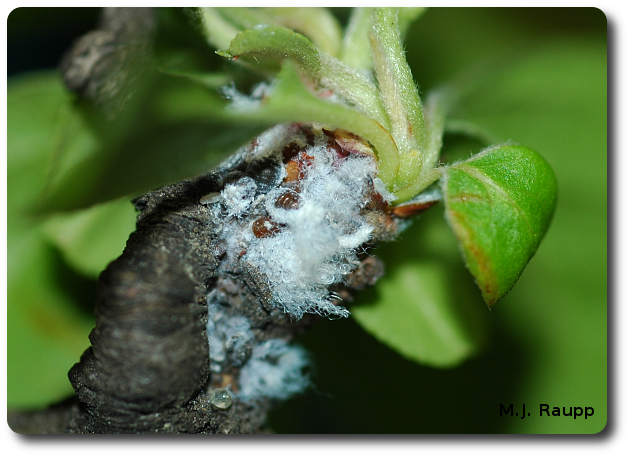 Some aphids like the wooly apple aphid produce large amounts of fluffy wax. Nymphs insert their stout beaks into the plant’s phloem. The beak encloses a tube connected to a miniature pump in the aphid’s head. The pump passes food along to the digestive system of the aphid where nutrients are extracted and used for growth and development. Phloem sap is relatively poor in nitrogen but high in carbohydrates. To obtain enough nitrogen for growth and development, large volumes of plant sap must be imbibed. Excess residue of this extraction process is excreted by the aphid as sweet sticky liquid called honeydew. Did you ever wonder how populations of aphids explode seemingly overnight? During spring, many species of aphids engage in a type of reproduction known as parthenogenesis meaning that the population contains only females and no males. That’s right just grandma, mom, and the granddaughters giving birth to more daughters by the hundreds. When it comes to aphids in spring, there is a sucker born every minute. A ferocious field ant prepares to attack a sneaky lady bug larva that ventured too near its flock of aphids. Another fact of life contributing to explosions of aphids is their ability to eschew the usual insect-like business of laying eggs. During the rush of spring, many species of aphids dispense with the egg stage and, like humans, give live birth to their babes. This blessed event takes only a few minutes but appears to be fraught with significant drama. Birthing aphids do lots of posturing and pushing. Fortunately, aphids have sucking mouthparts and loud vocalizations accompanying human births are conspicuously absent, hence the silence of the aphids. To further accelerate the process of filling the world with their kind, female aphids carry embryos of their grandchildren within their bodies even before they are born. This greatly compresses the generation time for aphids and is part of the reason aphid populations rapidly grow from a few to thousands. With so many delectable morsels decorating plants in spring, one wonders why hungry predators don’t consume aphids into oblivion. Aphids have friends, rather bodyguards, in the form of several species of ants that protect them from their enemies. Why ants protect aphids is somewhat of a mystery but it appears to be part of a “deal” struck between primordial ants and aphids more than 20 millions years ago. Aphids and ants often occur in the same locations and habitats. For eons ants depended on plants for sources of food such as seeds, leaves, and fruits. They also found meat in the form of small insects living on plants. Then as now some of the most common denizens of plants were aphids and their kin. Ancient ants contacted aphids and their honeydew and realized a good thing when they saw it. Ants use honeydew as food particularly as a source of carbohydrates for energy. 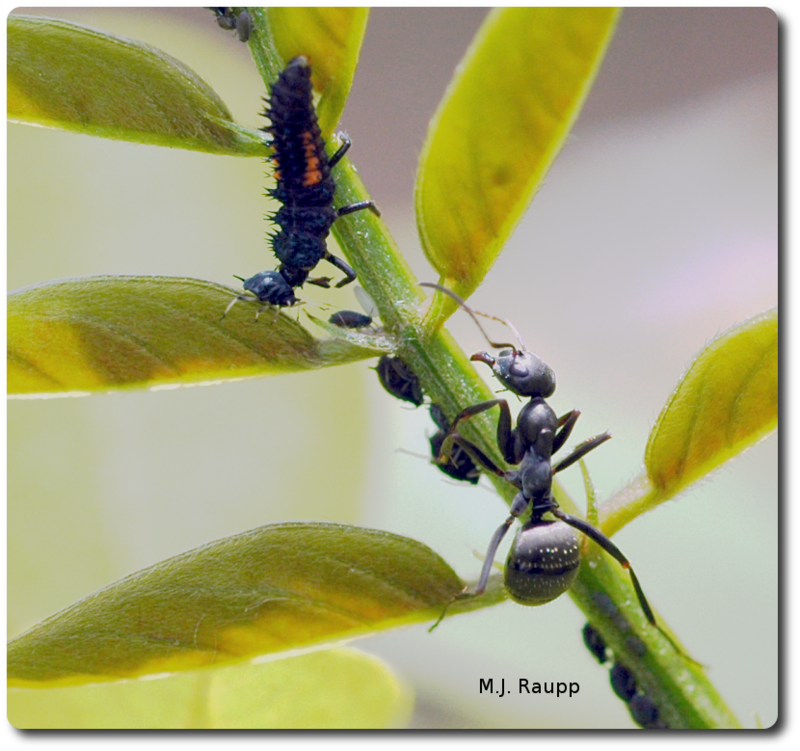 In return for the sweets, ants provide protection for aphids. They drive off would be attackers such as ladybugs and parasitic wasps thereby enabling aphids to survive and multiply. If you carefully watch an ant tending its aphid flock, you will see the ant stroke an aphid with its antennae. The contact will elicit the production of a droplet of honeydew from the rear end of the aphid. The ant consumes the honeydew and moves to the next aphid for another drink. Next week’s episode of Bug of the Week reveals the terrifying plight of aphids when bodyguards fail to protect them. The wonderful books “The Ants” by Bert Hölldobler and Edward Wilson and “Aphid Ecology” by A.F.G. Dixon were used as references for this Bug of the Week.